The G5 Montec 85-grain is a three blade, one piece, all steel construction broadhead. It is a one inch cutting diameter and 100% spin-tested accuracy. It is priced at $49.95 for a three-pack. The Wasp Hammer SST features a 1 3/16" cutting diameter with .027" stainless steel blades. It is a three-blade replaceable broadhead with a stainless steel smart tip. It is priced at $44.95 for a three-pack. The Jak Hammer Broadhead is a mechanical broadhead that opens to 1 3/4" cutting diameter. It has three surgically sharp stainless steel .036 blades that are retained by an O-ring. It has a stainless smart tip for ease of penetration. It is priced at $46.95 for a three-pack. The Sabertooth features a leading cutting edge with serrated main blade. It weighs 125 grains with a cutting diameter of 1 3/16". The main blade is 2 3/16" long for ease of penetration. It is priced at $49.95 for a package of three. The Steel Force Premium 100 Broadhead is made of knife grade stainless steel with individually ground and stropped blades. 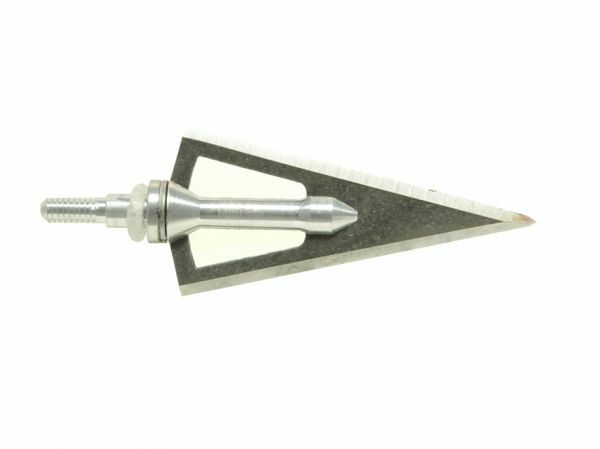 This four-blade leading cutting edge broadhead has a one inch cutting diameter and its main blade is 2 3/16" long for easy penetration. It is priced at $49.95 for a package of three. The Steel Force Phat Head Swing Out Blade broadhead is a leading cutting edge broadhead with two opening blades that are held in place by a small magnet that opens on impact to make the broadhead have a 1 1/2" cutting diameter. The bleeder blade is .040" thick and is 3/4" wide. 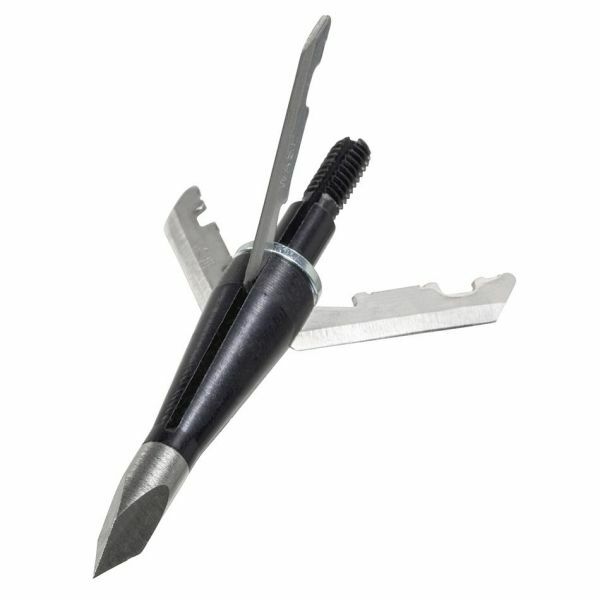 This broadhead is priced at $49.95 for a package of three. 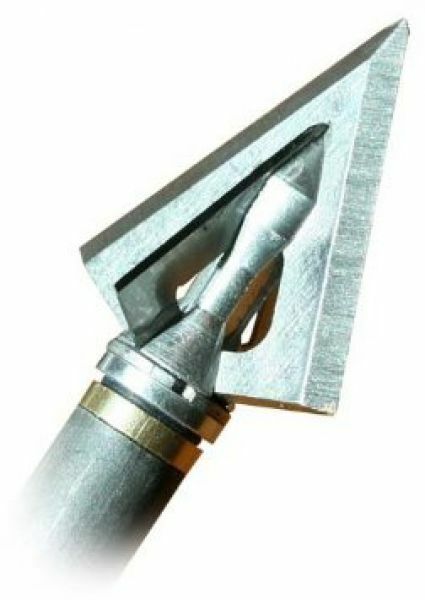 The Phat Head is a fixed blade leading cutting edge broadhead with outstanding sharpness. The ferrule is made of a 7075 T6 aluminum. The Phat Head has a one inch main blade cutting diameter and a 3/4" wide bleeder with .080" stainless steel main blade thickness. The Phat Head 100 broadhead is priced at $46.95 for a package of three. 7075/T9 alloy hard anodized camo finish on these shafts with a weight tolerance of +/-1% come with Super Uni-bushing factory-installed and have a straightness tolerance of +/-.002". An all-carbon shaft with C2 carbon construction that features a micro-smooth finish has straightness tolerances of +/-.006" and weight tolerances of +/- 2 grains and Super nocks are factory-installed. Carbon-graphite shafts are finished with a state-of-the-art ultrasonic system to give them a clean, smooth surface. Hand-weighted for an overall weight tolerance of +/- 2 grains and they have a straightness tolerance of +/-.006", a high-speed arrow weighing 5.7 grains/inch.